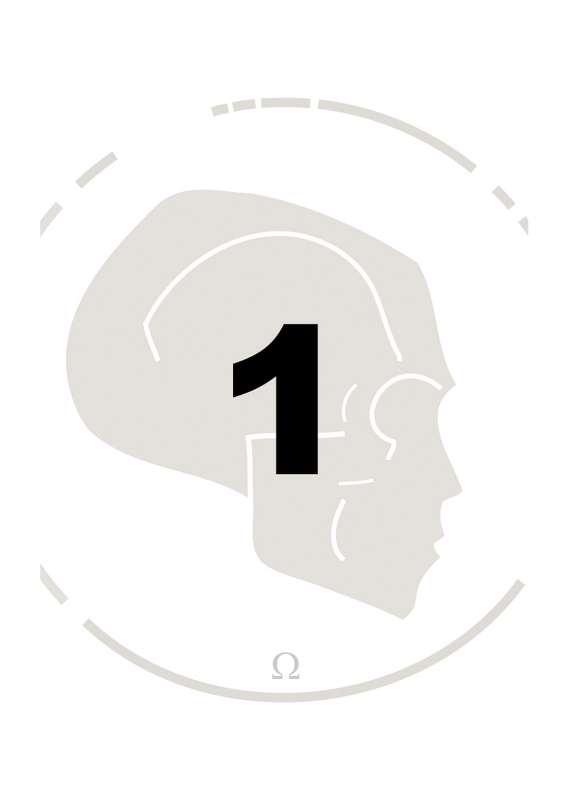 The urban myth says that the average person uses less than 10% of their brain, and the latent part could be developed to provide supernatural psychic powers. I don't know about superpowers and all of that jazz, I'd just like to not lose my keys so often. Thankfully, Travesty games believes the myth because they've come out with a game that has two superhuman brainiacs blasting each other with psychic powers that would make Dionne Warwick's Psychic Friends Network go green with envy. Or maybe cause their heads to explode in a sea of broken teeth and grey matter. Either way, it's got really cool art, and in a 2-player card game, only the art and gameplay really matter. I got this review copy after gently harassing one of the owners, Gil Nicoll, with my own brand of supernatural ability, the ability to annoy a person to death with seas of emails and phone calls. He sent it out, and it arrived within a couple of days, and I was on it like stink on tournament Magic players. I read the rules, and was absolutely dumbfounded because I couldn't figure out how to separate the cards into the two equal decks that was required. As it turns out, my amazing psychic powers were not nearly up to the task of turning the deck over and noticing Alpha and Omega symbols on the backs of the cards that indicated whose cards they were. While it was clearly an oversight on my part, I was a little bummed that it wasn't in the rules, and I have to admit, I called Gil to get the skinny. The rules had another omission that required me to call Travesty, which was how to count life as it was indicated that you needed to track life, but nothing in the box allowed for it. He told me that a pencil and paper or D10 die are perfect for the task, which was fine by me. In fairness, though, I have to dock them a point for not having a complete, playable game out of the box for that, just as I did for Munchkin. Another point was docked, so to speak, for the rules, which were not nearly as clear when it came to life tracking, setup, and some of the finer points as I would've otherwise wanted to see. Gil reassured me that I got a pre-release copy and that the rules are already printed and amended with the appropriate information, so he gets his point back for that, at least. The game ships in a single-deck box, and contains 72 cards and a single 8.5 by 11 rule sheet complete with explanations and illustrations on how to play. As noted before, the art is absolutely superb, and while the rules were reasonably well written when it comes to gameplay, there were a few questions on setup as I previously mentioned. The real trick is to read the rules while looking at the cards, because the rules don't go into detail regarding each and every card, so it helps immensely to take a quick look at the cards to understand the interactions between them. As noted, you will absolutely need something to track ten life points, but beyond that, it's good to go right out of the box. That's all there is to the game, and for a fifteen dollar card game, that's all there really needs to be. Starting the game is simple. First, you will need to separate the cards, using the Alpha and Omega symbols on the card backs. Each player has an identical set of 36 cards, and they'll stack them into defense and attack decks based on the indication on the card fronts, with 18 each. 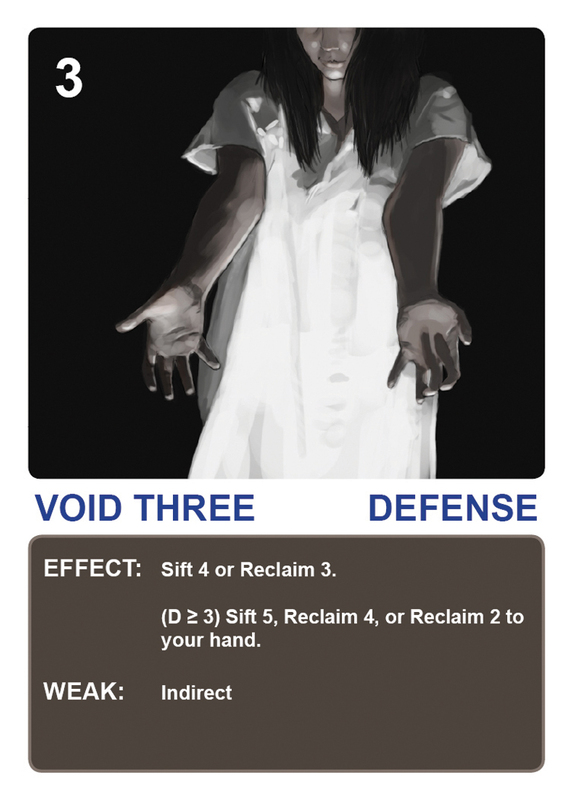 Each player will choose six starting defense cards and set them in front of them, face down, in a two deep by three wide formation, which represent your psychic defenses. These also act as targets for your opponents attacks, and the value of the card, one, two, or three, is printed on the backs. The first player may then draw five cards from any of their two decks, and the second player draws seven. On each subsequent round, each player, on their turn, will draw two more cards to replenish their hands. To play the cards against their psychic nemesis, players must burn cards equal to the value of the card played in order to activate it. This method also applies when replacing defeated defense cards. 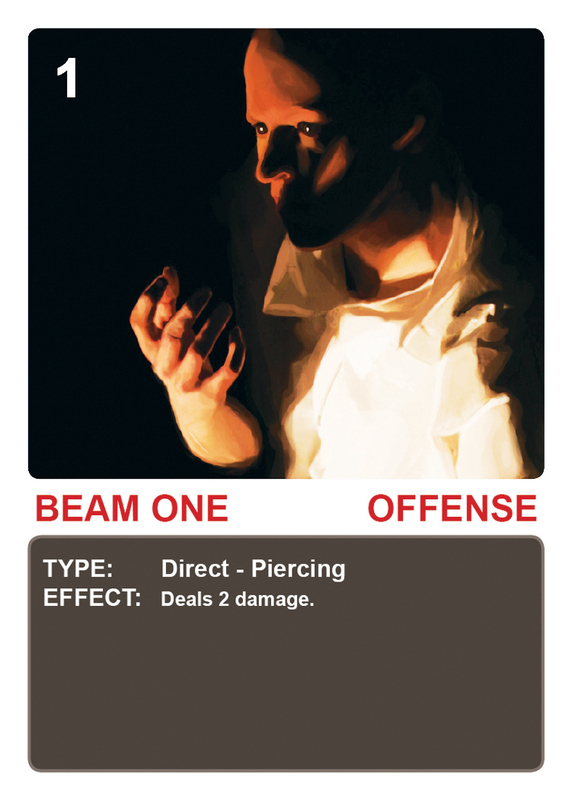 There's a variety of card types to play on offense, such as the beam or blast power cards that affect only a single card in the front row of your enemy's defense, or other cards such as the arc that damages a V shaped pattern of cards. Some cards penetrate the front row and will also affect the back row, and all of the cards have special abilities that trigger if a defense card is destroyed. Speaking of defense, there's a variety of those card types as well. In all cases, if a defense card is not destroyed by an attack, a defensive power is triggered which can do such things as cause the vile opponent to burn cards from his draw pile, allow you to look through the top few cards of either of your decks and rearrange them, and the best part, reflect damage back to your opponent.If a defense card is revealed, but not destroyed, you may replace it with another card that you have in hand, for free, on your turn. The final aspect of resolving attacks is direct damage, the only thing that will win the game. 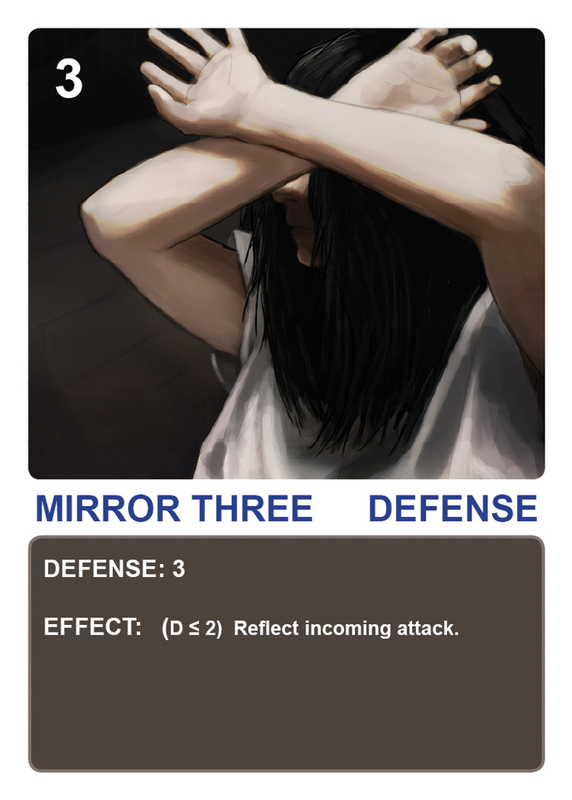 Attack cards will have a damage value and type of damage displayed, and this value determines how much of a junk-punch you actually do to the mind of your opponent, which is represented in life points. 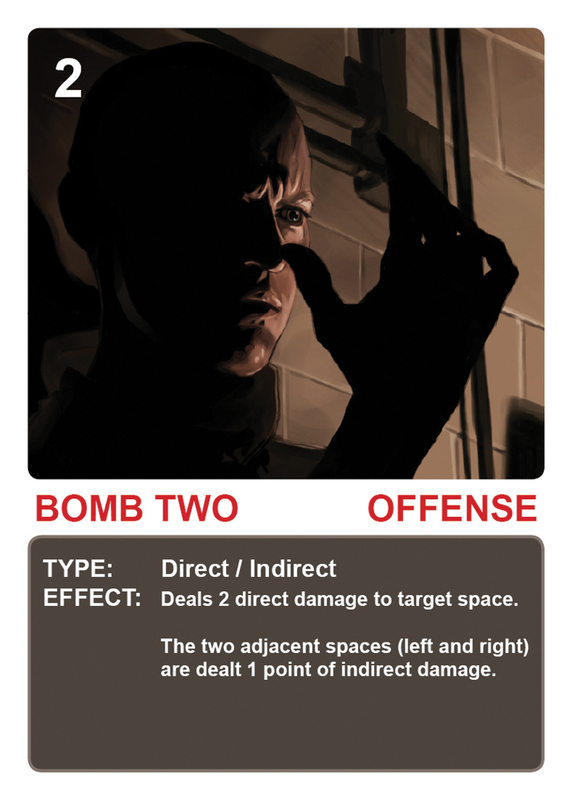 The final aspect of attacking is that if you do direct damage to the opponent, and it's caused in the middle row of defense cards, the player receives double damage. Do ten damage to your adversary, and you win the game. There is a lot of strategic variety in the game, and while the cards can be somewhat complex to resolve when a bomb or arc card is played, as you must resolve multiple cards, this game is incredibly fast-playing. If you took more than thirty minutes to play, even initially, you're probably doing something wrong. This is a smart, fun little card game, and this comes from a guy who is perpetually 'meh' about card games in general. If I had one real reservation about this, it's that there's only 18 cards per side on offense and defense, and thus the replay value may suffer in the long term, although I've played it quite a bit and haven't found myself tiring of it yet. The long and short is that it is certainly a hell of a quick, two player filler game for a husband and wife to play or for a couple of friends to play while waiting for the rest of the squad to arrive on game night. I like this game quite a bit, and the dark theme is gritty and reminds me quite a bit of the Silent Hill series of video games, although the cards that depict a male remind me of Agent 47 from the Hitman series of games. In both cases, I was thoroughly impressed. The game is very tight, and quite well designed, and the only complaints I have with it are that the rules could've used a hair more polish, which I am told was addressed, and that there is no life tracker in the box. As far as short, filler-type card games go, this is a great choice for people that like huge, nasty player interaction and a strong theme. You can demo this game at GenCon Indy 2011 at the Travesty Games booth, number 757! Go mess with Gil and Adam, and tell them that Pete sent you! Demoed this game at Gen Con based on your review. Ended up buying it right there. It is an awesome little "take that" filler game. I agree with the rules omissions, I had to go back to the booth the next day with a few questions and to get a few explanations about how some of the cards work. All in all, a great little game.